Our therapists at Physioactive work with the leaders in regenerative therapy, and can speed up the wait times to see these leading medical professionals. 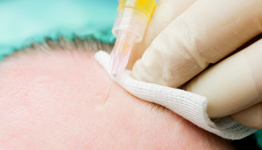 Dr. Gordon Ko an educator and leader in the use of injections to enhance healing works alongside the professionals at Physioactive to accurately assess how the body is working and assess the appropriateness when this next step is needed. Leaders in the evaluation of movement, distinguishing between those areas that move too much, hypermobility, versus those that are stiff, hypomobility. With this expertise, our therapists are able to make a definitive diagnosis and determine which type of injection is most suitable for you. Physioactive and Dr. Ko have been working over 10 years together treating some of the most treatment resistant conditions. Dr Ko, a world leader in prolotherapy and/or platelet rich plasma (PRP), Botox, hyaluronic acid, and Traumeel, has had tremendous success with therapy at Physioactive in returning clients back to work and play. Our therapists at PhysioActive work collaboratively with Dr. Ko to provide the highest level of injection therapy. Always on the cutting edge of what is available in the healing arts, Dr Ko and PhysioActive will explain how the role of each injection procedure, how they will work for you, and guide you in your therapy.